Jenga belongs to Cryptologic’s Casual Game Slots series. This series has slot games based on popular but unusual games like Cubis and Sudoku. Jenga is also a branded slot game and has been developed under license from Pokonobe Associates, whose registered trademark Jenga is. Jenga is a popular game in which players try to match of blocks of the same color. This objective has been carried to the slot game as well. Jenga does not look like a slot game at all. Instead of a layout of symbols there is a tower of blocks. On closer inspection, however, the elements of the slot game are discernible. The 18 layers of the tower form the 18 paylines of the slot game. Each layer of the tower has place for three blocks and these form the three reels. 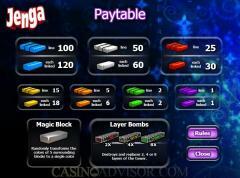 Jenga can be played with either all 18 paylines enabled or 9 paylines enabled. This means that the tower will have either 18 layers or 9 layers. Jenga fixes one coin per line and so the coin size is equivalent to the bet per line. Players can choose from over 25 stops between 0.05 and 20.00. The maximum payout per game is limited to 50,000 coins. The game is activated by clicking on the Play button. The tower on the screen vanishes and blocks start falling from the top to create the new tower. If any layer has blocks of the same color line payouts are offered. Additional payouts are given for blocks of the same color that connect to a layer of identical colored blocks. 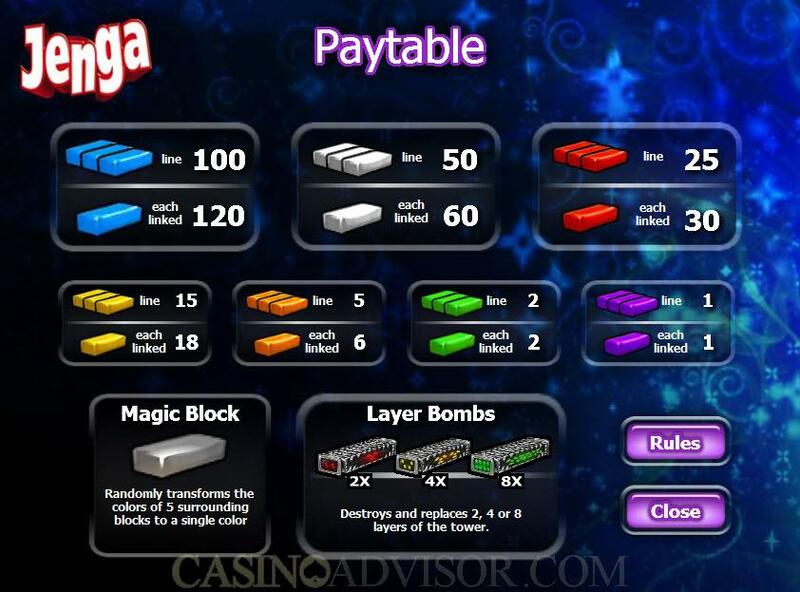 All the blocks involved in payouts are removed and the same number of new blocks is placed at the top. These may result in further payouts. The "spin" continues till no payouts are possible. Magic blocks, the equivalent of wild symbols, randomly transform the color of five surrounding blocks to increase the chance of getting winning combinations. Layer Bombs remove 2, 4 or 8 full layers from the tower and replace them with new blocks on the top. A Bonus block is awarded for each block in a winning combination. The Bonus blocks are added to the top of the tower. When blocks are removed from the tower it could become unstable and collapse. If this happens then the player is given a free game. 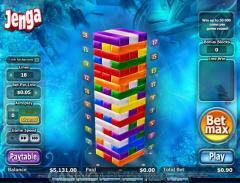 Jenga is a colorful slot game. In fact color is the only characteristic of the "symbols on the reels". As blocks get removed and new ones are added there is a transformation of color patterns. The background to the tower exhibits colorful psychedelic patterns which keep changing from time to time. A vibrant music plays throughout. Added to this is the sound of the blocks falling. Interested in reading more detailed information about Jenga? If so Click Here for more details.